While the “real” reviews are starting to slowly come in, we couldn’t let our super ninjas work go to waste so we present to you three minutes of Motorola Defy Mr. Blurrycam goodness. Actually this was taken with a G2 (we think) but from what we’ve been told for the most part the Motorola Defy is a sleeper phone and quite capable. Is it perfect and a true competitor to the myTouch4G? Not from what we are being told but then again, it should appeal to a different customer, someone who loves the idea of being able to dunk their phone in a fish tank for a few moments a time. I haven’t tried that in years but Motorola, if you want to send me a demo, I’ll gladly drop it in the Atlantic and see how long it stays connected for! Hey for just $99 it’s not a bad deal if you basically can’t destroy it! Of course, if you are looking to add this as a new line, Wirefly is showing some pre-order love for just $49.99 and free shipping! Check out the Phonescoop review for some extra Motorola Defy love! Nice! I need wifi calling so this phone is an option. Really excited about TMo and all the new <$100 offerings with $10 data plans. Also, nice job David and the TMoNews team – you guys have been on fire! I got a chance to play with this and the Mytouch 4g today at a t-mobile store. Although the MT4G is my choice, the Defy surprised the heck out of me. It was a neat little device a a big screen (for the actual size of the device). great mid-range device…probably the best out there. I really like this phone’s hardware. I don’t like motoblur. Can’t wait to play wit it at the store. For anyone who hasn’t messed with a 2.1 Motoblur phone, give it a chance. They’ve made some real improvements. Was in the store today and got to play with and compare a G2, MyTouch 4G, and the Defy. The Defy is an uber cool phone. It’s very small, all of the front taken mostly by the display. It’s heavy and solid. A great device. I put my Vibrant next to all three and my Vibrant looked huge compared to all of them. There’s some real choices out there for people. Sidenote: With all these phones individually being outstanding, I asked the sales reps which one do they recommend. They all told me that most people come in asking to see a specific phone they saw in an ad or on TV. Bonus Comment: I have to say the MT4G has the best form factor. It’s super thin and will fit nicely in any pocket. 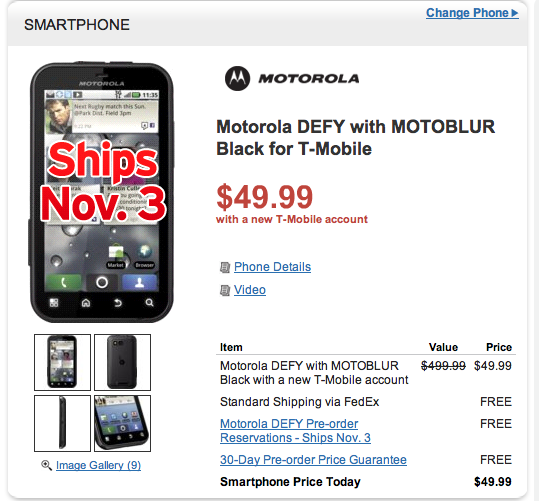 I approve of the Moto Defy (even with MotoBLAH, i mean Blur). i got a G-2 out for a 2 week trial spin last thursday. ringer is not nearly loud enough to be heard in a moving truck. goin’ to make the 75 mile drive and get the DEFY 1st. thing tomorrow morning.